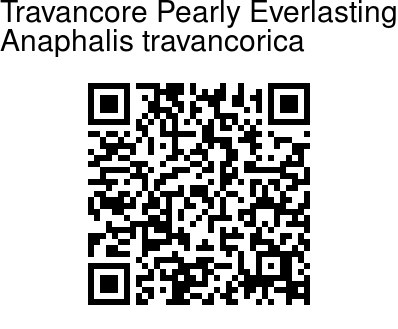 Travancore Pearly Everlasting is a perennial herb bearing clusters of small white flower-heads. Leaves are 5-6 x 1 cm, elliptic to inverted-lanceshaped, tip pointed, dense wooly. Flower-heads are about 6 mm across, white with yellowish centre, borne in corymbs at branch-ends. Bisexual flowers are plenty, central; flower broader; female flowers are 30-40; flower tube 3 mm, slender, hairless. Achenes are 1 mm, brown, papillose; pappus 3 mm long. 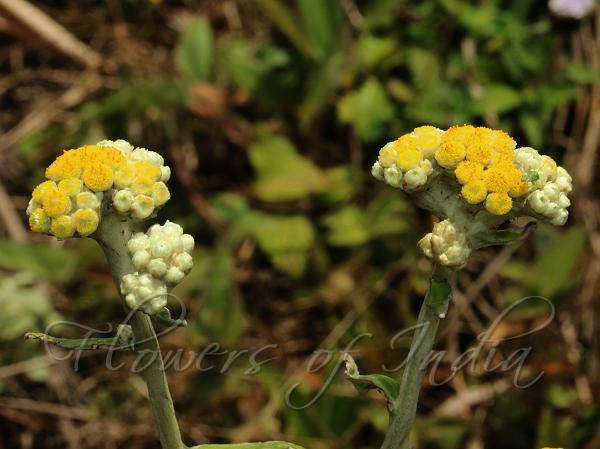 Travancore Pearly Everlasting is endemic to Southern Western Ghats. Flowering: September-February.